Situated 70 meters from a beautiful private beach, the Orbetello is in the heart of a haven of tranquility and close to the Natural Park of Maremma. With stunning views of the bay stretching from Talamone in Monte Argentario, the campsite is in one of the most beautiful places of the Mediterranean. Sun, rest, entertainment and good food will ensure an unforgettable holiday. Discover the spa towns of Tarquinia, Pitigliano and Saturnia, renowned for their thermal baths. A camping holiday in Venice ? The Italian dream! Showplace with its carnival and masquerade balls and famous for its Grand Canal and gondolas, Venice is also famous for its heritage, with the Basilica San Marco or its churches and monasteries steeped in history and architecture. During your camping trip to Venice, you'll see a bustling city by day but by night, you will find sought after tranquility. 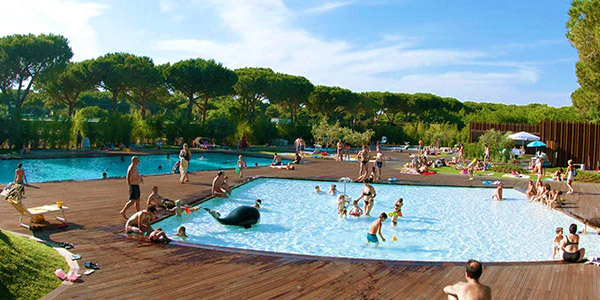 Enjoy a camping holiday in Venice accentuated by sports activities, wonderful visits to museums or art galleries, plus direct access to the first choice beach. Vagues Océanes offers mobile homes for 6 pers, 2 or 3 bedrooms for camping holiday rental in Cavallino Treporti in Venice.